According to Strategy Analytics Wearable Device Ecosystems (WDE) service, global smartwatch shipments grew an impressive 56 percent annually to reach a record 18 million units in the fourth quarter of 2018. Apple Watch maintained first position with 51 percent global smartwatch market share, while Samsung moved into a distant second place, overtaking Fitbit and Garmin. Global smartwatch shipments grew an impressive 56 percent annually from 11.6 million units in Q4 2017 to a record 18.2 million in Q4 2018. Global smartwatch shipments hit an all-time high of 45.0 million units in full-year 2018. Smartwatch growth is soaring, as consumers seek to accessorize their smartphones and bring digital connectivity to their wrists. Apple shipped 9.2 million smartwatches worldwide in Q4 2018, rising 18 percent from 7.8 million units in Q4 2017. In the rapidly growing market, Apple’s global smartwatch market share declined 51 percent this quarter, down from 67 percent a year ago. 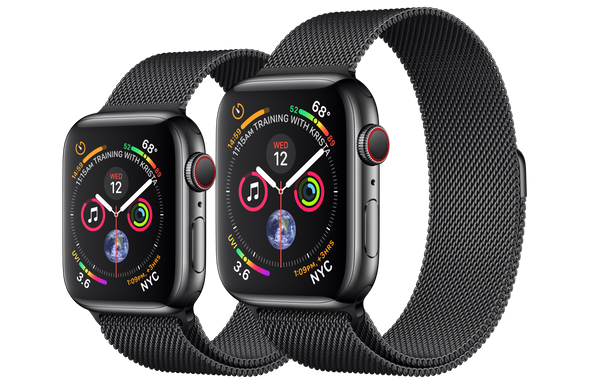 Apple’s smartwatches start at $279 (Apple Watch Series 3), $399 (Series 4), and $499 for cellular-equipped Series 4 models. Samsung shipped 2.4 million smartwatches worldwide and captured 13 percent global smartwatch market share in Q4 2018, up from 5 percent marketshare a year ago. Samsung watches start at $199.99 (Gear Fit2 Pro, Galaxy Watch Active, Gear S3), $279.99 (Gear Sport), and $329.99 (Galaxy Watch). 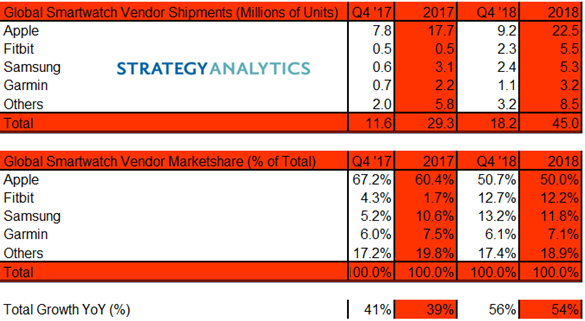 Fitbit captured 13 percent global smartwatch market share in Q4 2018, tripling from 4 percent in Q4 2017. Fitbit is becoming established as a top-tier smartwatch brand. Fitbit is very popular in the United States market. Garmin held fourth position and captured 6 percent worldwide smartwatch market share during Q4 2018, holding steady from 6 percent a year ago. Rising competition from Fitbit, Samsung and others in the sports and music categories is making it harder for Garmin to make headway in smartwatches. Combined together, Apple, Samsung, Fitbit and Garmin are the big four players, accounting for 80% of all smartwatches shipped worldwide. MacDailyNews Take: Obviously, as in personal computers, smartphones, and tablets, Apple doesn’t play in the low end of the market, so as the market grows it’s impressive that the company still dominates with current generation Apple Watches starting at $399 and $499 for cellular models. And how much of the revenue and profit do they command for this sector?